Federal Reserve economistRobert Hetzel argues that the severity of the 2008 downturn was caused by the Fed’s failure to continue lowering interest rates. As usual, no downside to lowering interest rates is discussed. Certainly nothing about malinvestment, the business cycle, entrepreneurial miscalculation, etc. The mentality: big aggregates are going down, so if we can get those big aggregates to go back up again, we have solved the underlying problem. Hetzel’s view recalls the Chicago critique of Fed policy during the Great Depression: the problem wasn’t the inflation that yielded the boom, but unduly restrictive Fed policy that supposedly deepened the bust. The monetary base did not decline, 1929-31. It rose, 1931-33. Federal Reserve credit fell, 1930-late 1931. It rose, 1932-33. It went flat after 1934. The money supply fell, 1930-33: the period of collapsing banks. The FDIC went into operation in 1934. (1) If the Federal Reserve failed by not extending credit, 1930-31, why did its policy of extending credit also fail, 1932-33? (2) If it failed in not extending enough credit, 1932-33, why were there no problems after 1934, when Federal Reserve credit went strangely flat? The money supply shot up after 1933. So did the monetary base. This was not because of increased Federal Reserve credit. Something fundamental changed in 1934. The FDIC went into operation in 1934. Bank runs ceased. The FDIC was the creation of Congress in 1933: the Glass-Steagall Act. 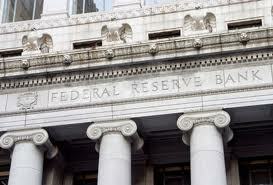 The Federal Reserve did not possess this authority, nor did any politician suggest that it should. For the Austrian vs. the Chicago view of the Great Depression, see my videoand accompanying resource page.